Born December 11, 1921, in Los Angeles, "Russ" throws right and bats left, is 6 feet tall and weighs 165. 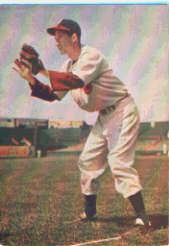 He attended the University of Southern California where he was all-conference shortstop. He started his professional baseball career in 1941 with Greensboro in the Piedmont League. Last year he played 17 games for the Boston Red Sox and has been optionally assigned to the Oaks for the 1948 season.